This incredible recipe is straight from Domestic Affair. "Lentils tend to be easier to digest than chickpeas. They also cook up a lot faster. This variation from your standard hummus makes a great spread for sandwiches, burgers or falafels, or as a veggie dip." I tried it and love how smooth and creamy it turns out, and tastes very subtle while having a good hummus quality. Place the lentils, sundried tomatoes and water in a small pot. Bring to a boil, then reduce heat and simmer for 15-20 minutes, until tender. Uncover and allow to cool for 10 minutes. Then stir in oil, tahini, garlic, cumin, turmeric and salt and puree with a hand-held blender, or scrape everything into a food processor and blend until smooth. Adjust seasonings to taste. Transfer to a serving bowl and drizzle with a olive oil or flax oil, and sprinkle with cayenne or paprika. Chill in the fridge until ready to serve. Store in an airtight container in the fridge for up to five days. Don't want to use sundried tomatoes? Replace with 1/2 cup roasted red peppers (homemade, or the kind you can buy at a deli or in jars), or 1/2 cup chopped artichoke hearts (home cooked, or you can use marinated ones, or the kind that come canned in water -- drain) and reduce the lentils' cooking water to 1 cup. Puree along with the other ingredients. This sounds delicious. 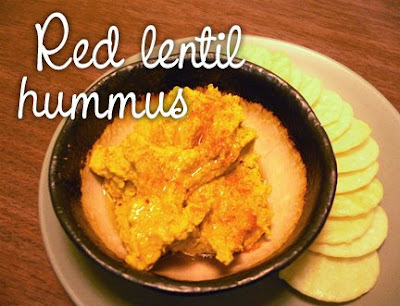 I often find chickpeas hard to digest, and love hummus, so this looks great. I can't eat tomatoes, so do you think a sweet red bell pepper would do the trick? Maybe eliminate 1/4c of water for this alteration? First time on your blog..Loved it..Nice ayurveda articles..Bookmarked..
That is a recipy . I think it would be a very delicious food. This picture is really eye-catching .I don’t like tomato so which item may I use as an alternative of tomato? Thanks for dropping by, Divya, Mansi and Rupa! Serena, you can substitute the 1/4 cup of sundried tomatoes with 1/2 cup roasted red peppers, and reduce the amount of cooking water to just 1 cup. Or, also delicious are artichoke hearts -- again, use 1/2 cup chopped artichokes (marinated, or the kinds that come canned in water -- drain) and reduce cooking water to 1 cup. Just wanted to tell you that I made this dish last week and it was amazing! Thank you so much for the recipe, it is one we will be enjoying again and again!